EUGENE, Ore.—Aug. 10, 2017—It’s no secret Ninkasi Brewing Company has a hop love affair. This continues to be evident in its newest Special Release Series beer—First Rule IPA. Originally released to Ninkasi’s Rare & Delicious Series in March 2017, the brewery is proud to elevate this beer to its Special Release Series in 12 and 22-ounce bottles and on-draft. Available August through December, beer drinkers can find First Rule IPA across Ninkasi’s distribution footprint. 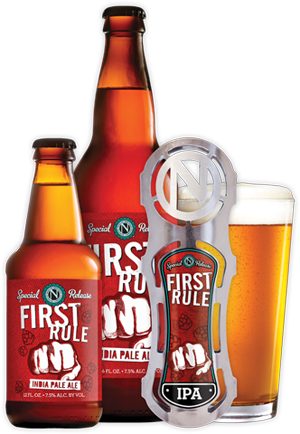 Crafted with the most sought-after hops, First Rule IPA is a testament to brewing without limitations. Ninkasi’s brewing team developed this recipe almost in secrecy, using the best hops available. The result? A flavorful IPA with an incredible hop profile featuring El Dorado, Calypso, Mosaic, Simcoe, Citra, and Amarillo hops. Use the Delicious Beer Finder to track down First Rule IPA and local Ninkasi retailers.